Wednesday, six other volunteers, two summer interns at BNRC, and I joined Doug Bruce and Mike Leavett, staff at Berkshire Natural Resources Council, to help construct a new trail on their Alford Springs property in Alford. It's 884 acres of now-wooded, formerly agricultural land in the Taconic range on the border of New York state. We met at 9am and worked until 2pm, with breaks and lunch. The top layer of decayed matter had already been removed from the trail. Our job was to crush rocks with sledge hammers to make gravel to fill in the dips. 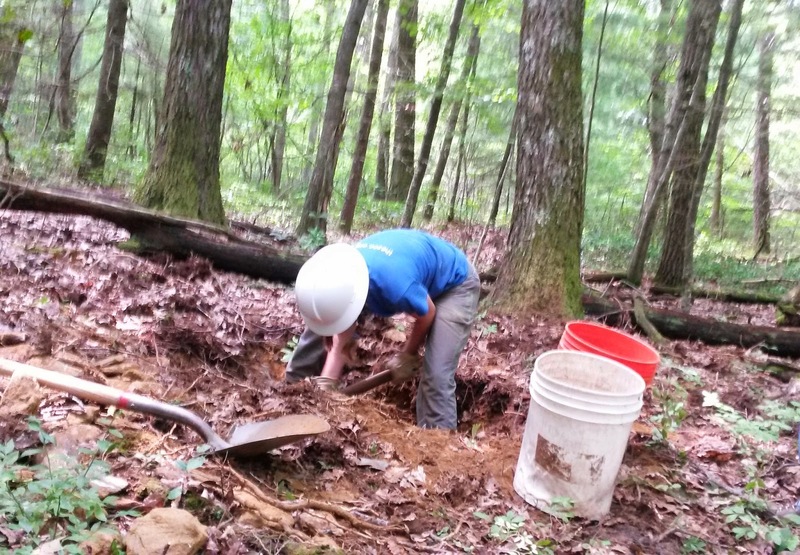 Next we went to off-trail sites to dig up subsoil, called mineral soil, a cross between sand and clay. We put the mineral soil in buckets, hauled them to the trail and dumped it on the rocks. We tamped it down around the rocks to provide a firm footing. Also, we gathered leaf matter and put it along the side of the trail and sprinkled it on the disturbed sections of the forest floor. After a few days and maybe a little rain, it will look like the trail has been there for years! It's great to learn some of what goes into designing and building a trail by working with the experts. It's heavy work, but with lots of helpers, it's amazing how much can get done in a few hours. Very satisfying! A good trail enhances the experience of being in the woods. 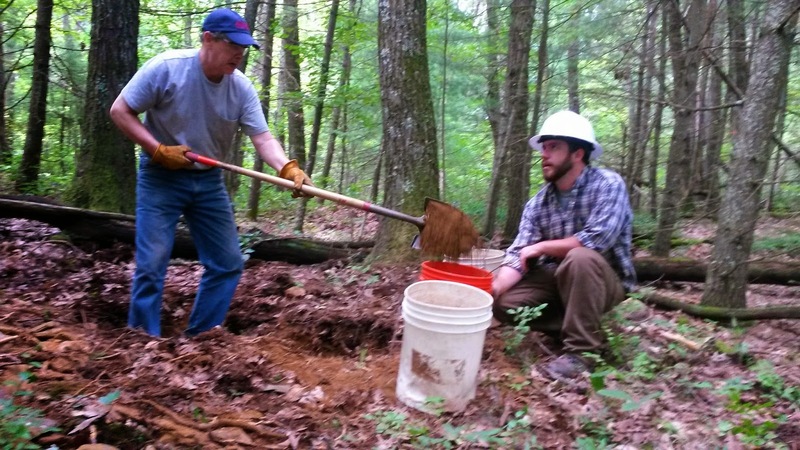 Thank you to BNRC and all the volunteers that work on our Berkshire trails! with a large pick-ax before it can be shoveled into the buckets. 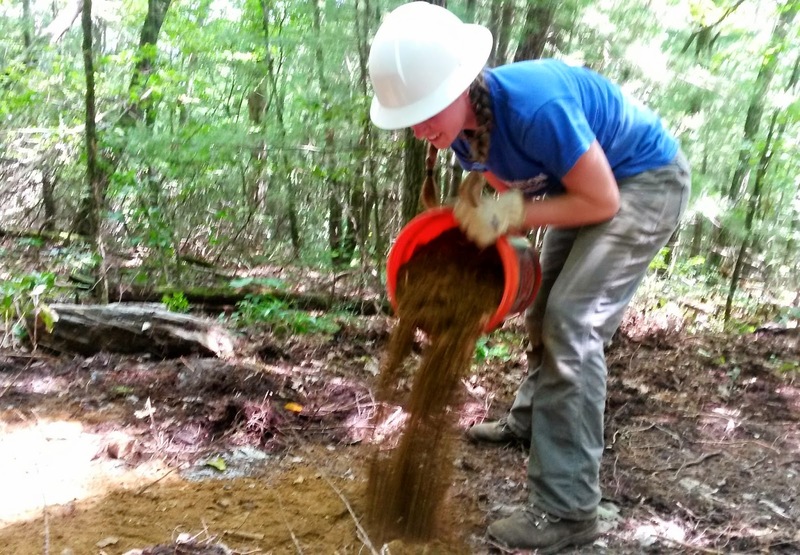 We carried many heavy buckets of soil to the trail. to make a firm trail, resistant to erosion but allowing water drainage. 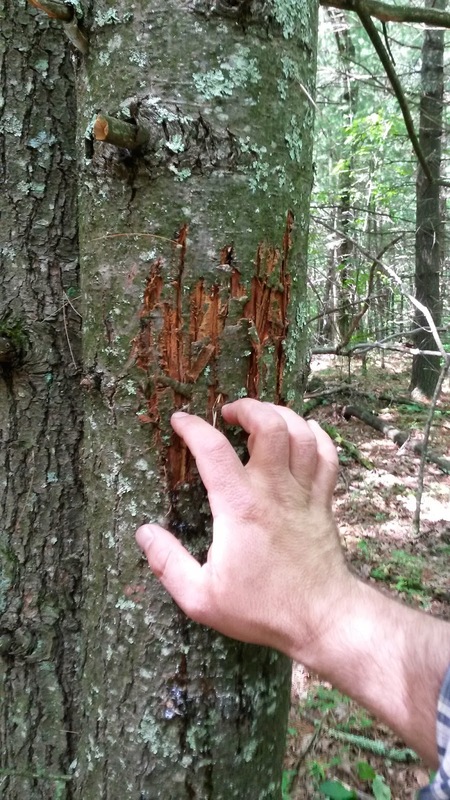 Mike showed us a fresh bear scratching on a young pine tree. What long powerful claws they have!